These Cherry Frosted Donuts have a tender, moist cake-like texture with a dreamy cherry frosting! Perfect for holidays, Valentine’s Day, or general breakfast enjoyment. One of our favorite indulgences on a Saturday morning involves a run to the local donut shop. I can’t resist the tender, sweet pastry with my morning cup of coffee! But if you’re like me, who wants to leave the house and get out of their pajamas on a Saturday morning? Or basically, any morning? 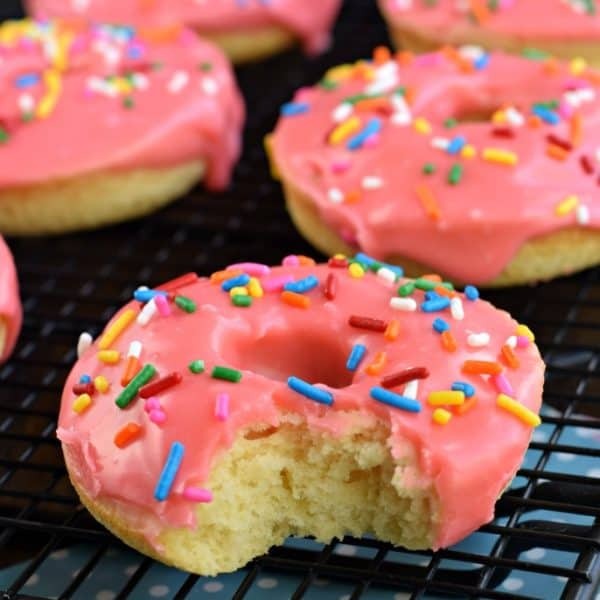 I’ve created the perfect doughnut recipe, all you have to do is bake them and eat them! One of my favorite donuts to get from the doughnut shop is a strawberry frosted doughnut. You may remember a few years back when I made these Vanilla Bean Baked Donuts with Strawberry Frosting. So good, and so perfect for Valentine’s Day! Well, today I’ve got an even BETTER tasting donut base with an equally delicious cherry frosting. Start by preheating your oven to 350 degrees F. Spray a donut pan with non-stick baking spray, or lightly grease and flour the pan. Set aside. 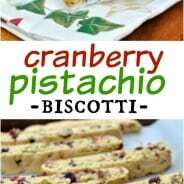 In a large mixing bowl, combine butter with sugar and beat until creamy. Add egg and milk. Slowly add in flour, baking powder, and kosher salt. Beat until combined, about 1-2 minutes. Using a large ziploc bag, fill bag with donut batter. Snip off the end of the bag. This makes it easier to pipe it into the cavity of your donut pan. Fill 6 donut cavities and bake in preheated oven for 10-13 minutes. Remove and immediately flip onto a cooling rack. Cool completely before adding glaze. For the cherry frosting, in small saucepan on medium low heat, mix together the cream, milk, butter, vanilla and cherry gelatin mix. When butter is completely melted, turn heat to low and add in the white chocolate. Once it’s melted, whisk in the powdered sugar and mix until fully blended. Spread frosting over cooled doughnuts and add sprinkles, if desired. 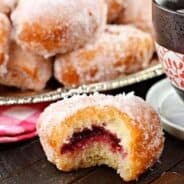 Can homemade donuts be frozen? You can definitely freeze these doughnuts. Once the frosting has hardened, slide doughnuts into a freezer safe ziploc bag (or other airtight container). When ready to thaw, remove from freezer and thaw at room temperature for an hour (or over night). These Neapolitan Donuts are so easy! 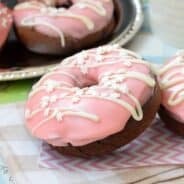 Baked chocolate donuts dunked in a sweet strawberry frosting with white chocolate drizzle. The perfect “snow day” breakfast! Classic Chocolate Donuts with a Chocolate Frosting. You just can’t go wrong with this simple recipe! These Cherry Frosted Donuts have a tender, moist cake-like texture with a dreamy cherry frosting! Perfect for holidays, Valentine's Day, or general breakfast enjoyment. 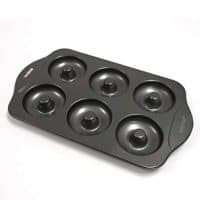 Preheat oven to 350 degree F. Spray donut pan with non stick baking spray. Set aside. In a large mixing bowl, begin making the donut batter. Combine the sugar with butter and beat until blended. Add in the egg. Mix in the milk, flour, baking powder, and salt. Beat until combined (about 1-2 minutes). Once it's all combined, spoon it into a large ziploc bag and snip off the corner. Then squeeze into each donut cavity, evenly distributing the batter between donuts. Bake for 10-13 minutes, until lightly browned. Remove from oven and cool in pan about 10 minutes. Remove and cool completely on wire rack. 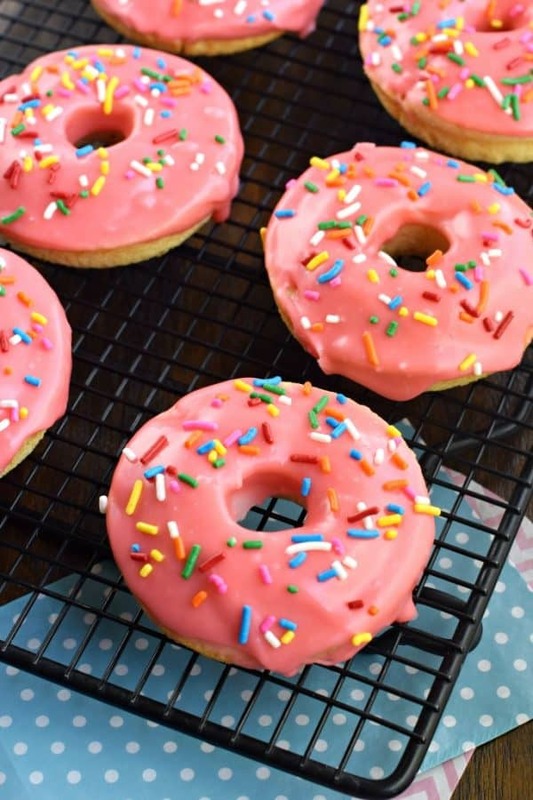 While donuts are cooling, make the cherry frosting. In a small saucepan on medium low heat, mix together the cream, milk, butter, vanilla and cherry gelatin mix. When butter is completely melted, turn heat to low and add in the white chocolate. Whisk until blended. Remove from heat and whisk in the powdered sugar, adding it slowly until desired consistency. 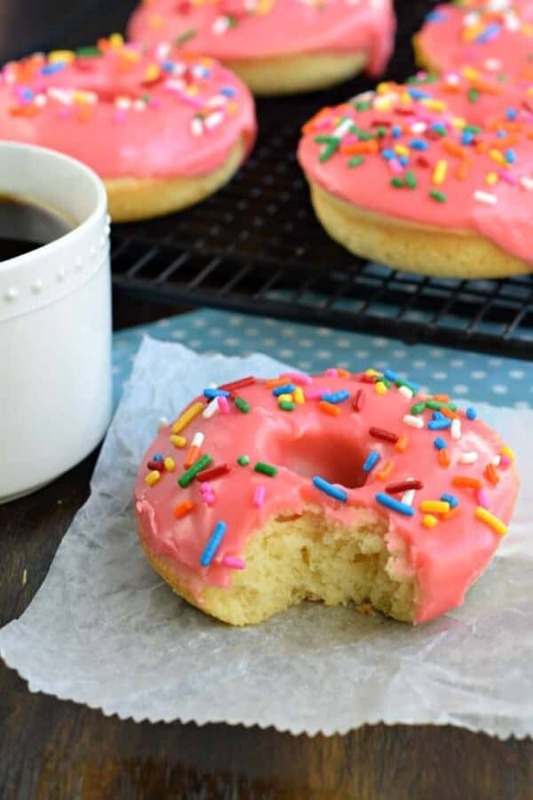 Dip each donut into the glaze, allow to cool. (optional- sprinkle with toppings). Allow frosting to set (about 15 minutes). Enjoy! I just love that bright pink color! These donuts were a hit with the whole family! 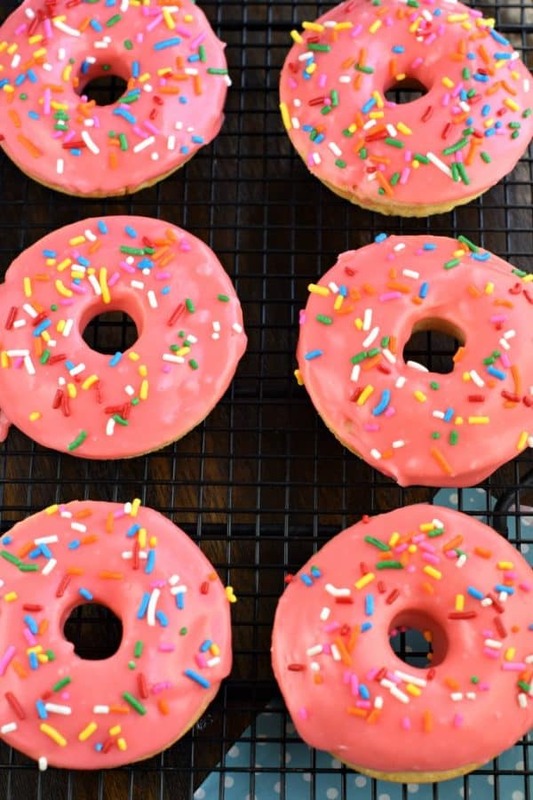 I love making doughnuts at home and these look irresistible! And it’s so much better than having to dress early in the AM and dash out to get something yummy. I’m all for enjoying in my PJs! 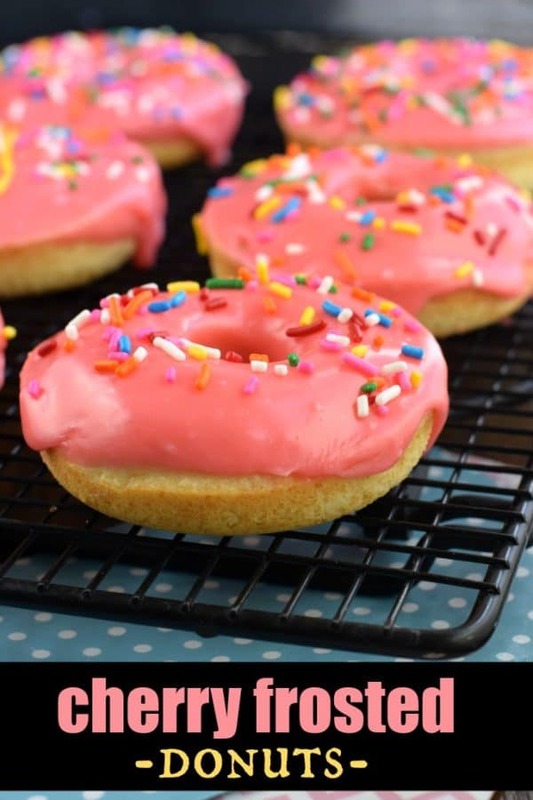 Love these for Valentine’s Day and the sprinkles …. oh yeah! These donuts are so dreamy. The cherry icing is amazing! Wow! These donuts look ahhmaaazing! That cherry icing..YUM!! My family can’t stop eating these donuts…so delicious!! These are absolutely adorable! My daughter wants to make them for her birthday party! Thanks for the recipe!